The staff looked after us in a very personal way, if we didn't want to join in with organised activities they would ask if there was something else we would like to do. Food was reasonable for such a remote location. We hope to return to Viwa in the not too distant future. My Husband and I stayed at Viwa for 5 Nights & even though we knew it would be beautiful when we arrived we found that in real life it is much more beautiful and pictures simply do no justice. From the moment you arrive you are made welcome and to feel like family by the owners and the staff who come down to the beach to welcome you with smiles and singing. The staff are genuinely happy doing what they do and are well looked after by the owners. Every Meal we had was divine, all so fresh and well balanced with a good mix of seafood/meat and veg and also beautiful desserts our fave was the banoffee pie which is the best we have ever had! We took advantage of happy hour each night before dinner enjoying some cocktails. Whilst in Viwa we did some free activities: paddle boarding, snorkelling, local village visits and we also had a free scuba dive trial(as part of our package) in the pool with one of the owners Roy and it was a really great opportunity to try out scuba diving for the first time. My Husband then went out on a scuba dive and seen a turtle, Mantaray, a school of Baracuda and heaps of colorful coral. Snorkelling is also amazing with heaps of coral and fish able to be seen just a short swim off the beach. We also took advantage of other paid activites: We went deep sea fishing and caught various fish including a great trevally and got to see the sunset and also seen dolphins, a shark, turtle and sealfish, the next day the chef cooked up the fish i caught for my husbands dinner. We also had a romantic dinner on the beach which was really nice. I had a massage which was really relaxing and well priced. We went on a picnic on a private beach which was well worth doing we were taken on a 10 min boat ride to a nearby island with a picnic lunch, snorkelling gear and paddle boards and left there for 4 hours to enjoy our very own piece of paradise. The Bures are excellent and are cleaned daily. Picture perfect view from the bure so nice to sit out on the balcony or go down to the beach and lay on the beach chairs. There are only 11 Bures and no kids allowed so is very peaceful. We will most definately be back to Viwa and hope that too much does not change as it is truly perfect! Best honeymoon ever. Beautiful location & beach. We just returned from staying 7 nights at this beautiful Island for our honeymoon. We have visited a few Fijian island resorts now along with some on the Coral Coast and this has been the best Fjjian holiday experience we have had thus far. Sheung, Roy & Louise went out of their way to make sure from the moment we arrived that we we're welcomed into the Viwa family. Nothing was ever too much trouble. This resort has something very different to any other resort in Fiji.. this is a very personal touch. With only 11 bures on the island and it being such a small inimate resort, every staff member at the resort knows your name along with the other guests. You can be as involved as much as you want in the daily activities or you can just relax and not do anything at all. There are many activities to do daily. Basket weaving, cooking lessons, history hikes, village visits, snorkeling, handline fishing, diving, volleyball etc. The rooms are spread out along the beach from numbers 1 to 11. We stayed in bure number 5 which was perfect. We had a hammock right out the front (there are only 3 ) and a beautiful view of the reef . Every bure has their own thatched umbrella and sun lounges on the beach which was fantastic. The bures had everything you needed. The generous deck with super comfy chairs and ottomans were a great way to relax in the afternoons with a glass of wine or cocktail. The dinner menu changed every night which was great as you got to try something new and the lunch menu had so many options. The food was lovely. This resort being Adults only 16+ makes it a wonderful place for honeymooners couples or adults just wanting to relax and escape lifes busy daily grind. Don't expect tv's or Internet in the rooms. Although there is wifi at $20fjd per day in the meals area. . This resort is all about taking time out and enjoying all the beautiful scenery it has to offer. It is just a magical place and definitely one of Fijis hidden secrets. I would highly recommend visiting this beautiful place for a traditional Fijian experience which you don't get at the resorts in Denaru or on the Coral Coast. 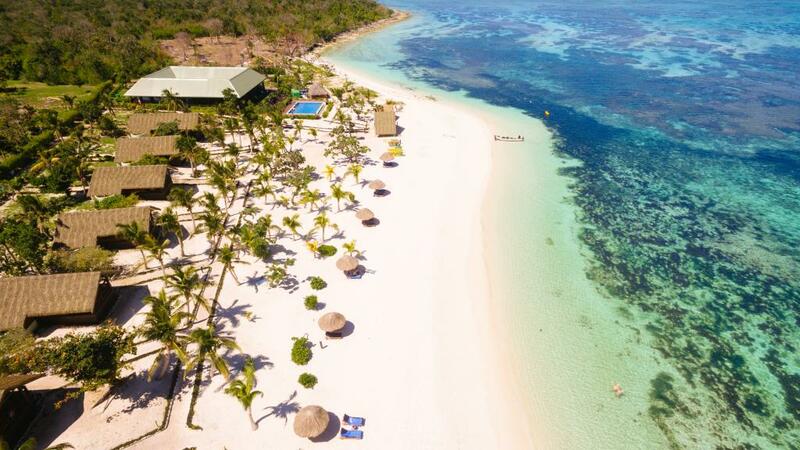 Escape to a truly Fijian tropical island! Beautiful beach, good for swimming, also at low tide. Rich coral reef. Resort with new owners. Superb houseband, good singer. More could be done against insects. We were here for a week for our honeymoon and while the trip out was long it was worth every minute. From the moment you arrive you feel like part of the family and it is truly an island paradise!! Would definitely return! A Great value exclusive island holiday with enough activities eg Village visit and 3 mile tropical bush walk, historic walk, Kayaking and snookling. Lovely beach with swimming all tides and in the pool. Max only 11 couples at anyone time, all good types,great staff. Need Mosquito spray or nets in the Bures especially after rain. Very kind staffs. Very beautiful place. The resort is set in an idyllic location on a small island, we loved it from the moment we laid eyes on it from the boat. The crystal clear water, the turquoise colours, the coral reefs, the magnificent bures set back from the beach, the glistening white sand, the beautiful meeting area, the music being played as we arrived - all perfect. There were some activities provided if we wanted them but it was all tasteful and quiet and conducive to simply relaxing and enjoying ourselves. The 7 day package with free massages etc was an added bonus. The staff were friendly and helpful and willing to assist with anything. The guys playing music in the evenings were delightful and added a great deal to our enjoyment. The bures were well maintained, spacious and beautifully designed. I have never had a more relaxing holiday in a more beautiful place. We chose Viwa Island Resort for our honeymoon. We made our choice based on the location, the fact that there would be no children under 12 and that they had great reviews about snorkeling. From our arrival, right up until we left the service provided by Michelle and her staff was fantastic. The food was amazing! The cocktail list was extensive! We spent so much time just relaxing and reading on the deck of our bure or in the hammock. The daily activities provided meant that we could pick and choose whatever we wanted to do...if anything at all. We unfortunately had to leave the resort 1 day early due to the threat of Cyclone Evan. The staff were very organised and ensured that all guests were told on the Friday night that we would have to leave on the Saturday. They did all they could to make sure we were comfortable on our trip back to Denarau. We are definitely considering going back to Viwa for another holiday!